A great central location, easily accessible from Harrisburg, Lebanon, Lancaster and Hershey. Our friendly staff loves to help you 'jump start' your mornings with a free cup of coffee. Just come by the office from 8AM - 10AM. This campground is a mess, high grass, driveways dug up looking for water leaks which translated to no water at the camp sites, way too many year round sites not being taken care of (high grass, awning ripped and just plain dirty sites) areas with cabins waiting to be set up and it looks like they have been there for awhile. Never should the bathrooms have received a 9.5 more like a 3. Good sam needs to take away their affiliation. I don't usually write reviews, but I feel that one is needed in this case. We stayed at the AOK in Jonestown the weekend of the RV Show in Hershey 2015. Many of the other campgrounds in the area were full due to the show and the AOK was one of the few that had camp sites still available. I did a little research online and the few reviews I found were favorable and did not reflect any issues. So I called and reserved a 30amp RV site. But upon arrival they had placed me on a 50amp RV site. Didn't know it until we parked on the site and started to setup. I don't have an adapter for 30amp-50amp so I went to the office to find a resolution. The office staff were very friendly and accomodating and they tried to find an adapter to lend me, but in the end they moved us to a 30amp site. The site we moved to seemed to be a better site as well. It was near the end of an aisle facing the corn fields adjacent to the campground. So far so good. The next day we went to the RV Show and had a great time. Upon returning to the campground, around 8:30pm, we found that we now have neighbors. There was a group of three or four 5th wheels that had moved in around us. They apparently all knew each other and had congregated at the 5th wheel next to us (of course). One member of their group approached me and asked me if they were too loud or bothering us, I looked at my watch and I said "No, you're OK for now, until quiet time kicks in." Quiet time is posted to be 10pm. I thought he might get the hint. But no... they were loud and carried on until about midnight or so. We noticed that the whole time we were there, the AOK staff were non existent after 6pm. Nobody in the office and nobody doing rounds to check on things. I was going to complain to someone at the office, but I hate to be the bad guy. If people don't have the common sense or consideration for others, it won't do any good telling on them. Besides, I figured they got it out of their system on the first night. I was wrong... our neighbors carried on the next night also, though they didn't stay up as late. As I figured, they packed up and left the next morning. It appears that they were locals just partying at the campground for the weekend. The other thing we noticed was a strong septic odor, especially when the group of 5th wheels left. We noticed the same odor when we hooked up and when we left as well. We haven't experienced this at other campgrounds so it seems they might have a septic issue. As for the bathrooms.... they were not cleaned all weekend (Thursday-Sunday). On Monday when we were leaving, I noticed they finally attempted to clean them, if you call sloshing an old mop around on the floor cleaning. The other thing we noticed about this campground are the year round inhabitants. It seems that they have people living there year round. In the "seasonal section" there are a number of old dilapidated trailers that look like they are lived in all year. We even witnessed some inhabitants going off to work in road crew uniforms. There was a family living in two tents near our site. They came over to our site often and through conversation we found that they were living there, had one car and took turns using it to go to work. They were friendly enough but they felt the need to visit our site often, like we were their entertainment. I'm OK with being friendly and neighborly, but we were there to go places and do things, not hang out with the locals. 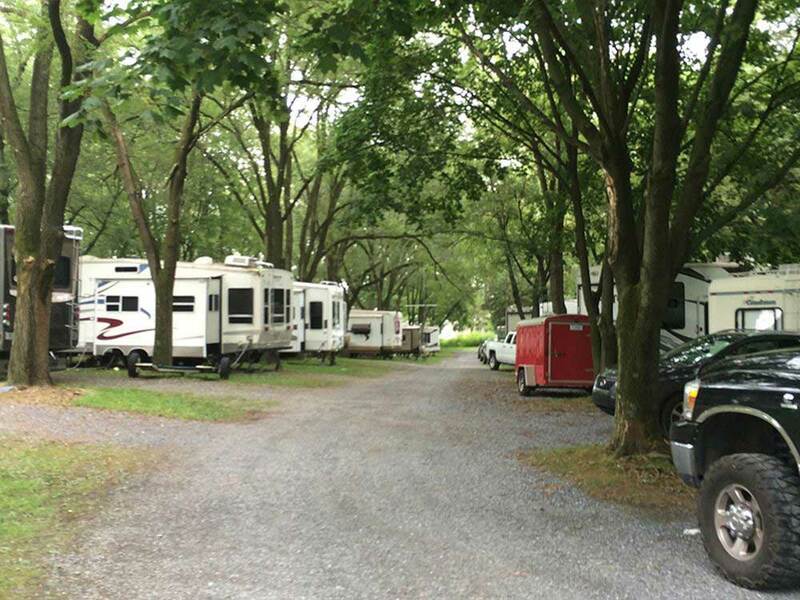 We definitely got the feeling that the AOK was more like a trailer park than a campground. On the other hand, the pool area was well maintained and clean, and the campground has a lot of potential. The sites are very nice and there are lots of trees giving you the sense of being in a forest. The corn fields surrounding the campground provided a nice view. In conclusion, everything is not AOK in Jonestown. I will not stay at this campground again and I do not recommend it to others. They really need to clean up their act if they want to attract more campers.